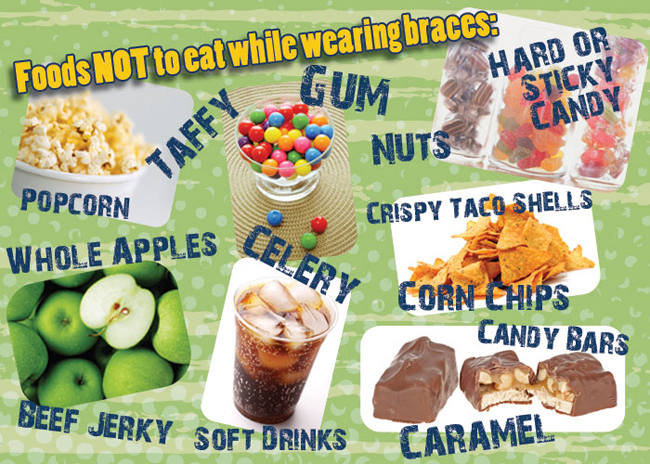 While you are wearing braces, please avoid eating hard foods, sticky foods, and foods high in sugar. Hard foods can break or damage the wires and brackets, and sticky foods can get caught between the wires and brackets. Minimize the number of sugary foods you eat; the sugar can cause tooth decay and other related problems. If you’re unsure about a certain food, you can always contact us. We encourage patients to quit bad habits such as fingernail biting, pencil and pen chewing, and chewing on foreign objects. All of these activities can break or damage your braces.